Where Ardal comes from (small-town Ireland) there is nothing worse than showing off. Yet he is a professional ‘show-off’ who continues to do stand up comedy for money, a very shy show-off (and as a result conflicted) but a big show-off nonetheless (a disgrace to his family). So why does he do it? Well. Just when he thought he’d made sense of the world, when he thought he knew everything he needed to know. When he finally found a hat that he liked and learned how to make cocktails and learned how to relax sagaciously in a big chair. Just when he was about to quit airing his dirty linen in public and stop (for the love of God) showing off. The world shifted. Dramatically. The world fell off its axis. And is adrift in the universe. And needs saving. In an age of raging populism, MeToo, identity politics, the end of truth, the collapsing middle ground, peak avocado and £15 Gin and Tonics, and terrified of being on the wrong side of history, and desperate to prove that his gender, race, age and class don’t necessarily define him, Ardal is forced to saddle his high horse again and ride fearlessly into the culture wars (with a white hankie in his pocket just in case), comedy as ever being the best emergency response mechanism to extreme events there is. 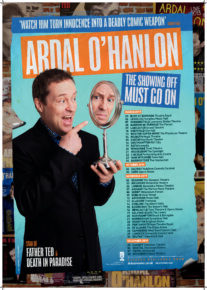 Ardal O’Hanlon, star of TV shows such as Death in Paradise (BBC) and Father Ted (Ch 4) and My Hero (BBC), continues to tour his acclaimed stand-up show worldwide. Because he loves it. And it’s a compulsion. And the world is a funny place.